I hardly ever run out of these things but on the rare occasion that I do, prepare for a meltdown. So when the team at Gringo Bandito contacted me about doing a review of their sauces, there was no question about interest! Bring on the sauces!! Hot Sauce really doesn’t have nutritional value. It’s vinegar and peppers, for God’s sake. What did you expect? Why are you even trying to determine the nutritional value of hot sauce? Just enjoy it! I received three full size bottles of the Gringo Bandito sauces, Regular hot, Super Hot and Green Sauce. The first thing I noticed was the picture, it gave me a good laugh because the blonde hair was too much. Then I opened each bottle and did a sniff test, my nose was happy, now for the taste test. Since I’m the only one on #TeamFrancis that enjoys heat, I decided to make a quick aioli for my avocado and carrot fries using the Gringo Bandito hot and green to spice it up. 1. Bring an inch of water to a boil in a small saucepan. Add garlic and cook until easily pierced with tip of a paring knife, 3 to 5 minutes; drain. Use a chef’s knife to mash garlic into a paste. 2.In a medium bowl, whisk garlic, egg yolk, Dijon, and lemon juice. Whisking constantly, add oil in a thin stream. 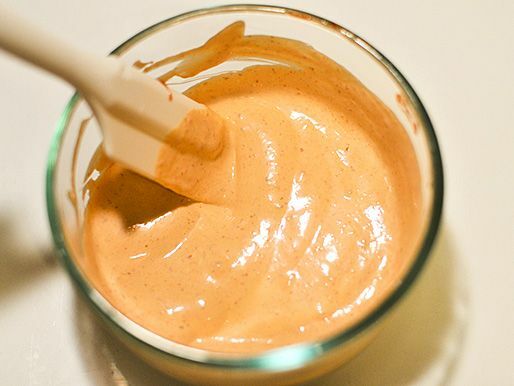 Whisk in paprika, cayenne, and hot pepper sauce. Season with salt and pepper. Since making this sauce, I’ve used it on chicken, lamb chops and even on my heroes. It is definitely a new staple in my refrigerator (stores well for 2 weeks).